Fifa presidential candidate Tokyo Sexwale has appeared before a US grand jury in New York as part of an on-going investigation into World Cup bribes. The BBC has learned that he was questioned in relation to an alleged $10m corrupt payment from South Africa to ex-Fifa vice president Jack Warner. Sexwale appeared as a potential witness at the FBI's request on December 17. He was a member of the bid board that successfully campaigned for his home country to host the 2010 World Cup. A US criminal indictment claims the money was paid to Warner via a Fifa account, disguised as football development cash, in order to secure votes for South Africa's bid. A grand jury is empowered under US law to investigate potential criminal conduct and determines whether criminal charges should be brought. A spokesman for Sexwale told the BBC: "He did appear before a grand jury. The FBI said he needed to appear and he went as a potential witness." 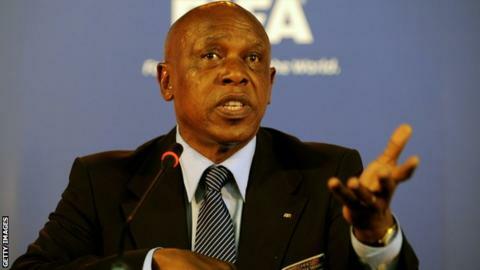 Sexwale is one of five candidates in the running for the Fifa presidency, with the election taking place on 26 February. The news of the investigation into Sexwale comes after Sepp Blatter, the president of world football's governing body, and Uefa boss Michel Platini were suspended for eight years from all football-related activities following an ethics investigation.